Annan went on to say that he still thinks a political solution is the only viable option, although he’s pessimistic about the chances of achieving this. Still, his “we left it too late” line is striking. Does he think that a military intervention might have been feasible a year ago, when he was trying to secure a ceasefire? Russia appeared genuinely convinced that the West might use force. And while the Assad government responded to the splits in the Security Council by escalating military operations, it could not be certain that its Arab and Western opponents might not take a more aggressive line. This doubt was a potential point of leverage for Annan. Should he take advantage of the uncertainties over external powers’ intentions or try to clarify them? How did the former UN Secretary-General handle this dilemma? After his appointment Annan pulled together a team of veteran UN officials and set up office in Geneva. While his team was highly loyal to him, divisions emerged over what strategy he should adopt. A relatively hawkish faction believed that Annan could use the swirling uncertainty to persuade Assad that his position was unsustainable. A more dovish group felt that it was necessary to reassure both Assad and the Russians that regime change was not imminent, creating a framework for talks. The doves were convinced that the chances of an outside intervention were still infinitesimally low and that it was essential to disabuse those opposition forces hoping for a repeat of the Libyan episode. Meanwhile UN Secretary-General Ban Ki-moon, who has mixed relations with Annan, was pressing hard for an early ceasefire. 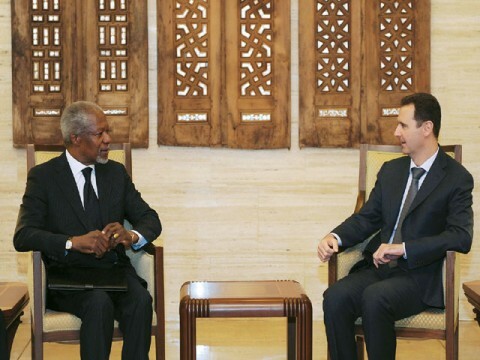 Annan visited Damascus on 10 March 2012 and held difficult talks with Assad, who declared he would not talk to “terrorists”. Although declaring himself disappointed by this encounter, Annan opted to follow the dovish route. His six-point plan was an effort to create a climate of confidence both outside and inside Syria. By tabling proposals that all the members of the Security Council could approve, he eased tensions between Russia and the West. By getting these powers to sign on to a deliberately non-threatening text, he reassured Assad that the chances of an intervention were low. So if “we left it too late” to intervene, Annan was partially responsible for the delay. You can read the rest of the Stability article – including some thoughts on what Annan could have done differently – here. This entry was posted in Conflict and security, Global Dashboard, Middle East and North Africa and tagged Annan, mediation, Syria by Richard Gowan. Bookmark the permalink.